Logan defies expectations. When a regular, Saturday matinee audience sits down to this, popcorn in hand, I imagine that they will come away from this somber, elegiac superhero movie with some disappointment, to say the least. There are no fist-pumping moments of cheer and no sweeping orchestral score to telegraph the emotional beats. For years, comic book fans have demanded that this genre be taken seriously. Well, Logan is very serious, and people should know going in that this isn’t like any of the other X-Men movies we’ve seen so far. Logan is an exploration of sorrow, loss, loneliness, and despair. It’s also filled with brutal, gory violence, stark and unforgiving. Logan doesn’t spare anyone – the innocent, the guilty, even the unfortunate souls that get caught in the crossfire. There are no easy callbacks to the previous films, other than Patrick Stewart returning to play Charles Xavier. While perhaps this doesn’t make for the kind of superhero movie that audiences are used to, what Logan does become is genuinely different and emotional in a way that none of the previous X-films can prepare you for. One thing is for sure – this is the story that Hugh Jackman has wanted to tell with this character for a long time. There are times that reminded me, strongly, of Jackman’s work in The Fountain, and like that film, Logan dives deep into the ideas of grief, of choices made and tragedy experienced. While there are powerful moments, Logan mostly eschews easy sentiment until it truly matters. At almost every turn, Logan rejects those around him. His existence is simply marking the time, working as a chauffeur to the spoiled and the wealthy, in a world of the future that has seemingly forgotten all about the struggles of mutants. In fact, there hasn’t been a new mutant born in over 20 years. All that is left for Logan is a dusty hideout in Mexico where Logan and Caliban (Stephen Merchant) take care of and keep Charles Xavier, now in his 90s and suffering from dementia and memory loss. Charles also suffers from mental attacks that incapacitate everyone around him, so Logan secures medication to keep Charles docile and drugged. But Charles’ attacks seem to be coming more frequently, and Logan is trying to collect enough money to purchase a boat so that he, Charles, and Caliban can get away from everyone. Finally, the adamantium in Logan’s body, after many years, is finally poisoning him, and his healing factor isn’t preventing it. Logan is slowly, but surely, dying. Logan tries to stay low-profile, but violence manages to find him all the same. 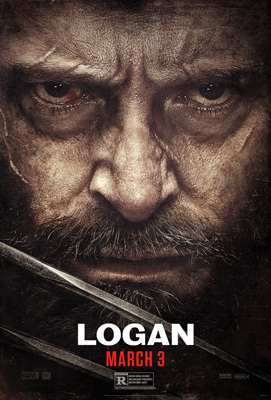 When Gabriela (Elizabeth Rodriguez) tracks him down to beg for his help, Logan coldly rejects it, but the situation around him brings Laura (Dafne Keen) into his life – a young mutant with Logan’s healing ability and adamantium claws, and soon a crew of assassins called the Reavers, led by Donald Pierce (Boyd Holbrook), track Logan, Charles, and Caliban down. Logan must, reluctantly, transport Laura across the country to a possible mutant sanctuary, with Pierce and his team hot on their trail. 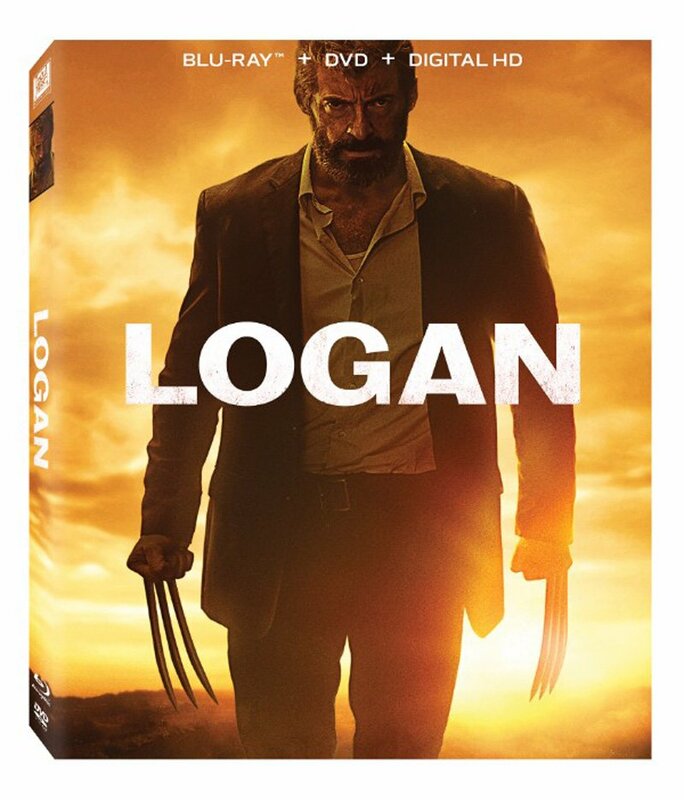 But Logan isn’t the man he once was, and as he, Charles, and Laura try to escape, Logan must face the truth of who he is, who Laura is, and what she may become. When I saw the first 40 minutes of Logan last year, I was expecting a sort-of Clint Eastwood turn by Hugh Jackman, but upon seeing the completed film, what I did not expect is an exploration of a damaged soul and some fairly raw emotion. When Mangold and Jackman decided to tell this story, it freed them from constraints that the previous films had placed upon this character, and I’m not just talking about the violence and freedom that an R rating provides over your standard superhero fare. Yes, the violence is unsparing, and Jackman drops the F-bomb many, many times over the course of the film, but an R rating also allows Mangold and Jackman opportunities to explore this character away from all the expectations and all the accoutrements that come with making another Wolverine movie. There are themes and ideas here that probably wouldn’t play as well in a less somber, more frivolous setting. Logan is also an opportunity for Hugh Jackman to do, basically, everything he’s ever wanted with this character. I’ve always admired Jackman for not only his skills as an actor, but the genuine love he has for this particular part. Over the years, I’ve had the impression, sometimes, that while playing in these kids of movies can certainly be financially lucrative, many actors don’t consider these kinds of roles especially challenging or even important, but it’s never seemed that way with Jackman. Jackman’s lived with this character for 17 years, and it’s always seemed that, although it’s clear that Jackman loves and cherishes this role, there are places he’s wanted to take Logan that simply weren’t possible under the banner of mere summer entertainment. I’m very happy that Jackman was given this chance, because he’s never been better as Logan. This is the culmination of everything he’s built with this role up until now. The same can be said of Patrick Stewart’s work here as Charles Xavier. I have the distinct feeling that when this script came across his desk, Stewart, like Jackman, saw this as an opportunity to tell a different and more emotionally-direct story. And, like Jackman’s work here, this is the best Stewart’s ever been as Xavier. The relationship between Logan and Stewart is marked by pain and tragedy, and these two actors are not afraid to take the audience’s expectations and subvert them to find a deeper meaning. Stewart is also quite liberal with the “colorful metaphors,” but they serve the character instead of the rating. Xavier is bitter and angry, that all the work he has done has come to nothing, and Stewart gives Xavier pathos, dignity, and lots of humor. He’s wonderful. Laura as a character presents a difficult challenge, considering that she’s mostly a mute, and the emotional range that is required of the role is substantial. But Dafne Keen, in her first film role, carries all that weight seemingly effortlessly. She’s funny, brutal, and at times even terrifying. Her actions suggest a ferocity that exceeds even Logan’s, and while Charles acts as a more temperate influence on her, there is always a threat that her nature can explode at any time. That’s a lot to put in a performance, and a lot to ask of an actor at any age, but Keen makes it work. She has an innate magnetism that works well onscreen, and seeing Jackman react to her is one of the more charming aspects of Logan, in a film that doesn’t have a lot of easy humor. Jackman and Keen are terrific together. What I find most admirable about what James Mangold and Hugh Jackman have done here (along with the screenplay by Mangold, Michael Green, and Scott Frank) is that everyone involved manage to steer Logan away from cloying sentimentality to find something more raw and heartfelt. Even the score by Marco Beltrami is subdued and low-key. When the emotional moments do come, they are earned. When the action setpieces occur, they are directed for maximum emotional effect instead of towards rowdy, fist-pumping moments. The fights may come across as cool at first, but then we see how these battles affect the innocent and the unsuspecting, and I admire greatly how Mangold shoots these scenes, which a minimum of shaky camerawork and a maximum of intensity. While the violence is abundant, it is never gratuitous. Mangold doesn’t shoot the action with mindless intent, or simply for thrills. The damage these mutants can do is real, and vicious, and unflinching. We can see how each character is affected emotionally, and we can come to understand how someone like Logan, who has lived this kind of violence every day of his life, would be unable to find peace. Again, Jackman does very great work in that regard here. All this gravity and seriousness means that Logan isn’t simply another consumable superhero story. I suspect that for a lot of audiences, this melancholy, subdued movie won’t be what they expected or even wanted. There are more moments of quiet, of character, than there are of action (to be honest, Logan doesn’t have much action in comparison to other superhero movies). There is a plot twist that I won’t reveal that, in another movie, would be played for maximum spectacle and effect. But Mangold, Jackman, and the script take a more interesting approach and use what could have come across as just another cool moment and instead turn it into another exploration of Logan, and a road that could have been his had Logan’s heart and soul had been different. At every turn possible, Logan challenges the tropes that have been built up around superhero movies, and while we will recognize the mechanics and gears that make these movies work, Mangold constantly is testing the strength of that machinery. The result is that Logan has massive respect for superhero cinema, and yet an intent to explore just what this genre can do in terms of storytelling. Logan has more ambition than a million Dawn of Justice movies. But Logan is brave for that. It strives to be genuinely different, and Logan has motivations that go beyond being a simple genre movie into a more profound exploration of grief and loss. When Clint Eastwood made Unforgiven, he filled it with everything he wanted to say about the Western, about violence, and the complexities and damage that violence does to the human soul. I’m not claiming that Logan reaches the lofty heights of that movie, but the ideals of the filmmakers here are just as pure and honest. Logan keeps growing in my mind the more I think about it (during the course of this review I’ve adjusted my number count probably four or five times now). It’s an experience I look forward to having again, and I am thankful that James Mangold, Hugh Jackman, and the producers of this franchise have given us something different and full of rich emotion and spirit. Logan is, truly, first class.